Two versions of this landmark season's stories have become available in recent years. 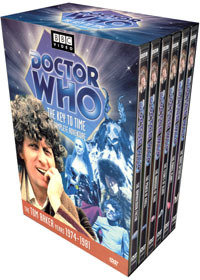 Doctor Who DVD releases were relatively new in 2002 when these six stories were rushed to market exclusively in the North American Region 1 NTSC format, to bump up the number of available Tom Baker releases, since it was thought he dominated in popularity over other Doctors even more here than elsewhere in the world. I wasn't complaining as season 16 is my favourite out of the 30+ seasons I've seen so far. For this quick 2002 release, the extensive restoration and remastering process found on other Doctor Who releases was skipped, and each story's special features were pretty much kept to a bare minimum of an audio commentary, production subtitles, silent photo gallery, and a "Who's Who" text biography of the actors. Only "The Pirate Planet" went a bit further with some film footage featuring deleted and extended scenes. When British fans were finally welcomed to join in the fun of season sixteen with a Region 2 PAL European Limited Edition DVD release in 2007, all the stops were pulled out. The stories themselves got the full treatment of picture & sound restoration & remastering that has breathed new life into the entire Doctor Who line. 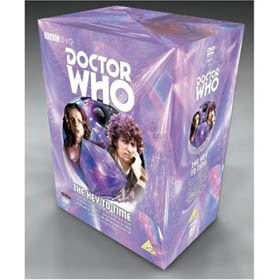 All the commentaries & subtitles from the 2002 set were included, while Tom Baker was brought back to add 3 more commentaries for the stories he had not previously done, along with co-star Mary Tamm and other production personnel. Best of all, a full set of making-of and other featurettes were included with each story. Photo Galleries were also upgraded to montage sequences with an audio track of sound effects. The "Who's Who" biographies, however, remain unique to the older set. The full fruition of this compilation came in 2009, when it arrived in North America as a "Special Edition" version, and then went beyond the "limited edition" status in Europe to a more general and widespread re-release. While North Americans were once again given the option of either getting all six stories in a box set or collecting just the ones they wanted individually, the season was only offered as an all-or-nothing box set in the European Region 2 format. This chart compares the features and extras on both sets of discs in greater detail. As you will see, for those that enjoy this era, the "double-dip" is well worth it! Picture & Sound restoration & remastering. Audio commentary by actors Tom Baker (The Doctor) and Mary Tamm (Romana). and Doctor Who Magazine editor Clayton Hickman. Rosalind Lloyd (The Nurse), John Leeson (Voice of K9), Primi Townsend (Mula), cameraman Elmer Cossey, and visual effects designer Colin Mapson, with vintage interviews of the late writer Douglas Adams, and recollections from his half-brother James Thrift, and his biographer Nick Webb. Audio commentary by actress Mary Tamm (Romana) and director Darrol Blake. fan magazine contributors Clayton Hickman and Steve O'Brien. Story: Romana is quick to find the fourth segment on the planet Tara, but extricating herself from the knights, castles, political intrigue, and android duplicates of Taran society is another matter, for which she will need the Doctor and K9's help. Audio commentary by Tom Baker (The Doctor), Mary Tamm (Romana), and director Michael Hayes. Paul Lavers (Farrah), writer David Fisher, and script editor Anthony Read. John Leeson (Voice of K9). "Defining Shadows" making-of featurette (15 min.) with director Michael Hayes, writers Bob Baker and Dave Martin, designer Richard McManan-Smith, actors Barry Jackson (Drax), Lalla Ward (Princess Astra), and Davyd Harries (Major Shapp). All sets include stories 98-103. See above for more details. The Key to Time is season 16 of Doctor Who. The Tom Baker Era (1975-1981) section of our Episode Guide Catalogue.